In few previous articles, I have talked about how to use “ANT Migration tool in Salesforce” and “How to Use EGit plugin in Eclipse to work with Git“. So to make this article short, I assume that you are already familiar with ANT Migration tool provided by Salesforce and Git. During project development life cycle it is very essential to backup your code and Configurations daily. However sometimes developers forgot to commit changes in Git, may be because of workload. It may create an issue if someone wants to check back history of code for that duration, there will be no use of having code repository in place if it cant help us to get out of problem. In this article, I will move one step further and explain how to setup automated script which will run on your System startup and commit backup of your Salesforce organization into local Git repository without any manual interference. 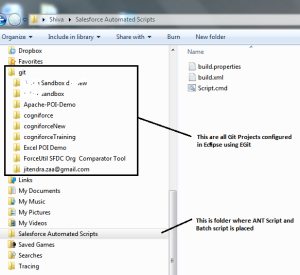 Step1 : Get your Salesforce project into Eclipse, If possible select every Metadata components. This step will give us “package.xml” file. Step 2 : Set up your EGit in Eclipse, It is explained here in very detail. This step will generate “.git” folder in your system which will have all information about your local and remote repository. Step 3 : Create “build.properties” file, may be one folder above your Source code folder. #Directory where Git Configuration is created by Egit. 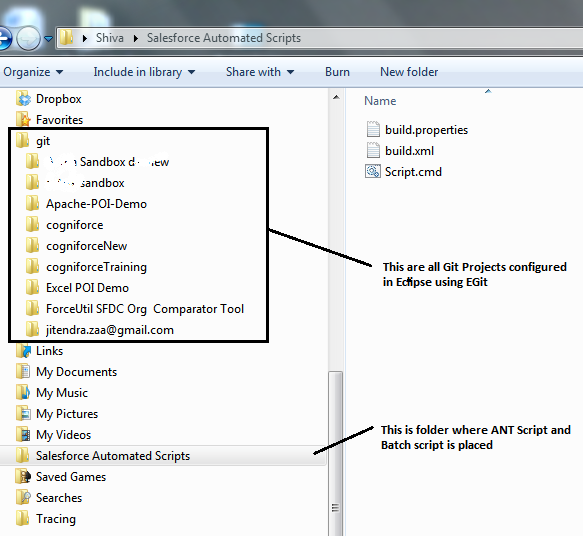 "../ denotes one folder above current folder"
You can read in detail about ANT configurations here. Step 4 : ANT Does not have any command for Git. So we have to write macro for ANT which will execute Git executable file from your operating System. retrieveTarget="RELATIVE PATH OF SRC FOLDER WHICH IS FETCHED BY ECLIPSE"
As per above file, target “GitOperations” depends on “SFDCFetch”. So first metadata information will be fetched into folder specified in attribute “retrieveTarget” of tag “sf:retrieve”. After that target “GitOperation” will be executed. As shown in above file, “GitOperations” uses “git” macro defined which eventually invokes Git executable file and passes required argument. To run above file, we simple have to use command “ant GitOperations”. However, If we want to run above files automatically, we need to create “Command/Batch” file in Windows or “Shell” file in linux. Step 5 : Create Command file in Windowst by name “Script.cmd”. This file needs to save in same folder where “build.properties” and “build.xml” exists. Step 6 : Add Shortcut of above command file into Windows startup folder. And at this step we achieved our target. Whenever you will start you System, this executable file will execute. I hope you believe on Energy saving and shutdown your system everyday before leaving office 🙂 . However if you doesn’t shutdown or Log-Off your system, You may need to check for “Scheduling Task” to run above command file once in 24 hours. Note : We have committed Data into Local Git repository only. Whenever you open Eclipse, you can use “Push to Remote” option in EGit. I tried to push automatically in remote repository however I run into issue where my Push Command in ANT hanged, I tried a lot but no luck. If anyone of you get lucky, please let me know. If you want to save log of Git operations daily, then we can pipe output of all operations to text file. Assume, Command for “ant git operation” is saved in some batch file named “AntCommand.cmd”. First of all Thank you for a really helpful and productive article. I have tried the above thing as you have mentioned, but I am getting the below error. Can you please help me solve it. Git has been installed in the above mentioned path. OK, please add this path to your environment variable. I have done that as well. I got the above error after adding it to the environment Variable only. May I know if the translations that we do are confined to just the namespace that we have in the managed package? If No, then may I know how can we restrict them to one Namespace? HI Kalyan, can you please explain your question in more detail ? Hi jitendra, I ve been following your log since long. Thank you for all the knowledge you share with people. I have a question regarding integration of TFS and salesforce ANT tool. Can you give me a brief idea about it? Hi John, I am working on TFS in my current project however I don’t see myself near to expertise. However please shoot your question, will try to answer if I can. Firstly Thanks for the awesome article. I tried for the same in one of my POC. However, i am stuck at one place.After configuring everything and invoking the command “ant GitOperations” in command prompt. I get the below error “D:Salesforce_Ant_37.0salesforce_ant_37.0samplebuild.xml:21: The directory you specified does not exist”. I have tried changing values of retrieveTarget,unpackaged and gt.Directory. But didnt get lucky till now.Can you please guide me in this regard. I guess, i am doing something wrong in these 3 variables. I managed to push the new branch to Git. I set up ant to retrieve all the code into git repo folder, and run window command to push(instead of pushing by using Ant).